Phantom Ranch is located at the bottom of Grand Canyon National Park, Arizona, near the junction of Bright Angel Creek and the Colorado River. It is near river mile 87.5 and can only be visited by hiking, mule ride, or river trip. Phantom Ranch is about 14 acres of the park’s 1.2 million acres. Grand Canyon is largely crags and cliffs, but Phantom Ranch is an oasis of nearly flat land along Bright Angel Creek and the creek’s delta in the Colorado River. The nucleus of the Ranch is about two dozen buildings in the resort complex including cabins, dormitories, restrooms, shower buildings, and dining hall on the east side of the creek. A National Park Service-operated campground is on the west side of the creek. Less than a dozen other buildings at creek side and the delta include a National Park Service (NPS) Ranger Station, NPS Trail Crew Bunkhouse, sewage treatment plant, mule barns, and residence buildings for NPS staff. Many of the Ranch buildings are constructed in a rustic style of natural materials such as rock and logs. When John Wesley Powell stopped here on August 15, 1869, he was so impressed with the creek’s clarity he named it Bright Angel Creek. Phantom Ranch got its name from nearby Phantom Creek which flows into Bright Angel Creek less than a mile upstream from the Ranch. The origin of the name Phantom is uncertain, but most likely comes from the observation that narrow Phantom gorge seemed to appear and re-appear in a phantom-like haze. Rust Camp was the first tourist enterprise in the area. Beginning in 1903 Rust improved the primitive trail from the North Rim. 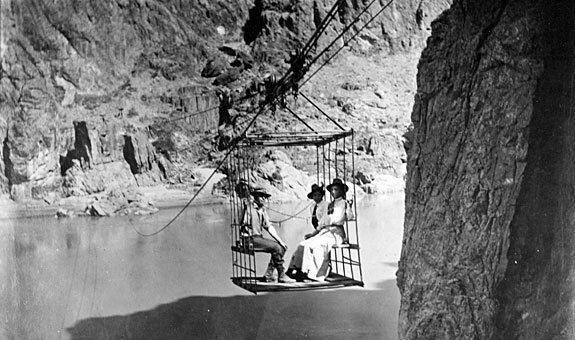 In 1907 he completed the first cable car across the Colorado River and took in tourists. However the camp had only tents and a maximum of twelve tourists could be accommodated. In 1913 Teddy Roosevelt visited the camp briefly and soon it was often called Roosevelt Camp. By 1917 Rust Camp was only in business part time and the cable car was no longer working. In 1919 the NPS nullified the Rust concession and soon awarded tourist operations in the area to the Fred Harvey Company. In 1933 another period of intense activity gripped Phantom Ranch with the arrival of the Civilian Conservation Corps. (See: Human History: Civilian Conservation Corps) The campground and nearby trails that were completed by the CCC in 1936 are still in use today. Phantom Ranch is at an ideal location to observe the results of flash flooding. Flash floods are an ironic reality in the desert. It may not rain much, but rain storms may be very heavy at times. Runoff can start quickly, as there are little porous soil and vegetation to hold the rain. Bright Angel Creek drains an area more than twenty-five square miles, and all the runoff is funneled into the narrow, forty-foot-wide, 2.5-mile-long, Box section of the creek just above Phantom Ranch. Normally Bright Angel Creek is 1-2 feet deep in the area. During historic times three extraordinary flash floods raged by Phantom Ranch. During the August 19, 1936 flash flood Bright Angel Creek was estimated at 22 feet deep at the entrance of the Box. December 3-6, 1966 is the most well known flash flood event through the Ranch sending the creek from its average of 22-24 cubic feet per second (cfs) to 4,000 cfs. On March 5, 1995 a gigantic rainstorm sent the creek to 15 feet deep at the Ranch and washed out the North Kaibab Trail and trans-canyon waterline. Normal water service to the South Rim was not restored for two and a half months. In 1970 a second area bridge across the Colorado was opened called the Bright Angel Suspension Bridge (or Silver Bridge). Its purpose is to carry the water pipeline that originates at Roaring Springs to the South Rim. When you visit Phantom Ranch take a moment to look closely at the rustic architecture of the Colter-designed buildings and the fine CCC-constructed trail work.